EnerGeo Solutions has varied experience across the landscape of government, industry, and academic research and development. Often this experience is shared across the entire landscape in a given project. 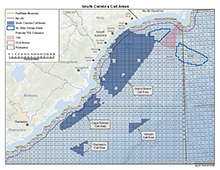 BOEM- SC call areas for wind energy efforts. The Bureau of Ocean Energy Management entered a cooperative agreement with the South Carolina Sea Grant Consortium. This project, titled: “Atlantic Offshore Wind Energy Development: Geophysical Mapping, Oceanographic Data Collection, and Identification of Paleolandscapes and Historic Shipwrecks offshore South Carolina” provides the environmental and socioeconomic study needed for the assessment and management of environmental impacts introduced by the development of offshore wind energy. It is a joint effort between the University of South Carolina and Coastal Carolina University, having additional participation from the College of Charleston and EnerGeo Solutions. EnerGeo Solutions brings advisement in the data integration of multibeam, backscatter, sub-bottom, and magnetometer datasets into a GIS environment while also providing workflows and training to Principal Investigators and student researchers. The USGS performed a study titled “Volcán Barú: Eruptive History and Volcano-Hazards Assessment” in 2007-2008. EnerGeo Solutions took interest in this work and decided to expand and update the research efforts. This work required living in remote regions of Panama and accessing the local earthquake seismological networks. Data resulting from the efforts of IGC-UNIVERSIDAD DE PANAMÁ and OSOP were acquired and analyzed. The data reveals additional patterns of, and occurrence of seismic activity within historic seismic gaps throughout the Isthmus of Panama. In these reactivating seismic gaps there are recent observable patterns of migrating brittle-stress loci occurring as short-term, annual and perhaps even bi-annual events. There is a strengthening correlation between the seismic resurgence in seismic gaps along Panama’s plate boundaries and elevated risks associated with Volcán Barú. 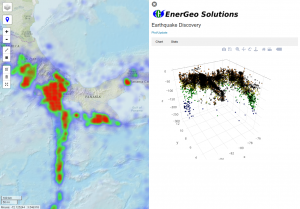 EnerGeo Solutions has already developed a webapp for searching and visualizing the earthquake catalogs available in Panama, and seeks to continue this research with further investigation, particularly relating to the Panama Fracture Zone.